Guests are invited to join the Pizza Dough Rewards program. For every $100 spent at CPK, they will receive $5 of Pizza Dough Rewards that can be redeemed on their next visit. To join, go to cpk.com, download the Pizza Dough Rewards App or sign up with a server. 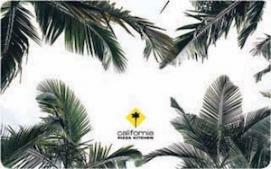 For more information on California Pizza Kitchen visit www.cpk.com." This gift card is redeemable only for food or beverage at all participating California Pizza Kitchen restaurants in the U.S. (excluding airport, stadium, university, Mirage Hotel, and Guam locations). Not redeemable for cash or credit unless required by law. Safeguard your card. If lost or stolen, replacement card with remaining value requires original proof of purchase, including 19 digit gift card identification number. Resale is prohibited. CardFact XVI, Inc. is card issuer and sole obligor to card owner. CardFact may delegate its issuer obligations to an assignee, without recourse. If delegated, the assignee, and not CardFact, will be sole obligor to card owner. Card funds do not expire. Card is reloadable at any time until 30 days after card has a zero balance. Purchase, use or acceptance of card constitutes acceptance of these terms. For balance inquiries, to reload or for customer service, visit cpk.com or any participating CPK or call (800) 91-WE CARE.